PC-7® is the original tough job epoxy! This paste epoxy was originally formulated more than 60 years ago for the maximum in bonding power. Professionals to the do-it-yourselfers select PC-7® because of its exceptional adhesion to metals, ceramics, masonry and many plastics. PC-7® is designed for permanent repairs. Where other adhesives fail…PC-7® won’t! Choose PC-7® if you want to: seal a crack in a wall, attach a hanger to a ceramic plaque, seal a leak in an oil pan, repair a granite monument, fix a leak in PVC pipe connection, create a multimedia sculpture, and thousands of other repairs. When mixed, part A (grey) and the hardener part B (black) react to form a bond of tremendous strength. The PC-7® formulation is slow curing, but slow can be a good thing especially for large tasks. PC-7® is thick. Thick is good if you need to work vertically or want to hold an object in place. How thick? Thicker than peanut butter but not as thick as bubble gum. Fibreglass, concrete, wood, metals, brick, glass, block, ceramics, rubber and more. Bond and repair stainless steel. Attach transition strips on concrete floor. Attach firing strips to concrete wall. Bond to and rebuild hard rubber bumper. 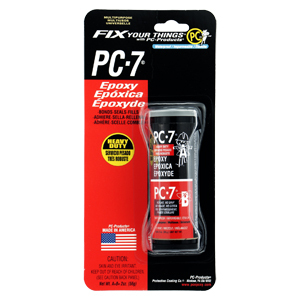 PC-7® PASTE EPOXY | 2 oz. 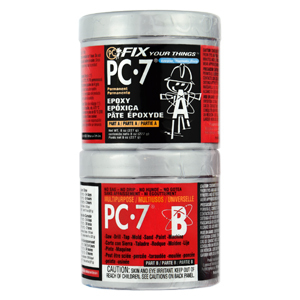 PC-7® PASTE EPOXY | 8 oz. How much coverage? Minimum suggested bond line thickness is 1/32 inch for two flat surfaces. Minimum suggested bond line for two uneven or rough surfaces is 1/8 inch. Roughly estimate how many ounces of PC-7 are needed to fill a void. Divide the cubic inches by 2 to get the approximate number of ounces. Remove contaminants such as dust, dirt, oil and grime with solvents such as Denatured Alcohol, Acetone, Rubbing Alcohol (isopropyl alcohol) or Lacquer Thinner. Mild detergent solution in water is also good removing contaminants. Use a clean paper towel or rag for wiping. Do not use Mineral Spirits or Paint Thinner for removing contaminants. Remove rust and loose paint with sandpaper or wire brush. Epoxy typically sticks to most paints. If there is a concern of the paint’s adhesion then remove it with sandpaper or wire brush. Smooth, glossy and shiny surfaces should be scuffed using sandpaper to increase adhesion. Use Denatured Alcohol, Acetone, Rubbing Alcohol (isopropyl alcohol) or Lacquer Thinner to clean tools and mixing surface before PC-7® cures. Clean hands and skin with soap and water. Cured epoxy can be removed by applying Paint Remover or Paint Stripper to soften the epoxy surface. Scratch off the softened epoxy. Repeat as needed. How thick can I apply PC-7®? PC-7® can be applied in any thickness. It does not require drying or exposure to air. It will cure from the inside out. I made a repair with PC-7® but need to build the area up more. Can I apply more epoxy? Can I use PC-7® for a vertical repair? PC-7® can be applied vertically and overhead. Because of its high viscosity it will not drip or sag. How long does it take PC-7® to harden? Normally, at 70F, PC-7® will cure in 24 hours but full hardness can take up to 48 hours. Cooler conditions will extend the cure time. Working in a garage or outside in temperatures between 50F and 60F may double the length of time needed for full cure. Applying PC-7® to a cool surface such as an exterior facing wall will slow down the cure. Can I paint over PC-7® and if so how? PC-7® should be primed then painted. Use Zinser Bullseye® 1,2,3 Stain Sealing Primer or equivalent. Priming/sealing is important to separate and protect the finish coat from the epoxy/amine surface. Can I use PC-7® on a finished surface? Smooth, glossy or shiny surfaces should be roughened or scuffed with sandpaper to provide maximum adhesion. Use 80 or 120 grit sandpaper. A roughened surface has much more surface area than a smooth surface. PC-7® is very thick. Can I smooth it out or thin it out? Use a solvent such as Denatured Alcohol, Acetone, Rubbing Alcohol or Lacquer thinner to smooth applied PC-7®. Be-cause PC-7® is very thick and gooey, it is necessary to apply alcohol or acetone to the tool or gloved fingertips in order to lubricate the surface and shape or feather the applied epoxy. Can I use more of one part of PC-7® in order to speed the curing? Adding additional hardener does not make PC-7® cure faster. It is best to mix PC-7® one part of A to one part of B. However, PC-7® is probably the only epoxy that does not require precisely a 1:1 mix ratio. Plus or minus 25% A or B does not affect the performance. Adding additional PC-7® (+50%) part B hardener (black) can improve the adhesion to difficult surfaces such as PVC pipe and fittings. Measure equal volumes of part A epoxy (gray) and part B hardener (black) then measure an additional half portion of hardener (black). This will make the mix ratio (1 : 1.5, A : B). Can I tint PC-7® to match a surrounding color? PC-7® can be tinted with iron oxide or carbon pigments. Powdered pigments are used to color stucco or concrete and can be found at art supply stores. Universal tints that are used to color paint are compatible with PC-7®. Too much tint may affect the performance of PC-7®. I want to do a repair outdoors and the epoxy seems really stiff? PC-7® becomes more viscous in cool temperatures. Set the containers in a warm place prior to mixing. Acetone has been used to reduce the viscosity of PC-7®. The addition of acetone will contribute to shrinking and slow down the cure rate. PC-7® performs best without the addition of solvents. What will PC-7® bond to? It is easier to say what PC-7® will NOT bond to: Wax paper, Teflon, Plexiglass, vinyl and some softer plastics. Test an area if in doubt and always rough up shiny, smooth surfaces with sandpaper. Even after 24 hours PC-7® will still be soft or flexible. 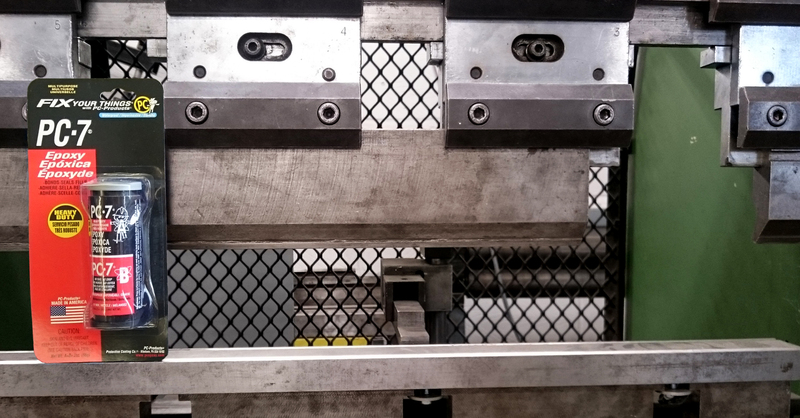 An additional 24 hours is usually enough time for the PC-7® to reach full hardness. Temperatures 40° F and below will cause the PC-7® reaction to pause. The reaction will resume when the temperature increases. Apply heat via a heat lamp to gently warm the repair. Heat guns and hair dryers should be used with caution because they can be too intense. It is easily the thickest epoxy sold to consumers. It is supposed to be very thick. A good stiff putty knife is helpful when measuring and mixing. The best way to fully and completely mix PC-7® is on a flat smooth surface such as scrap plywood or thick cardboard. Measuring equal volumes of part A and B is easier with larger quantities than tiny. It is tougher to visually determine small equal volumes. This can result in wide % differences. However, old PC-7® can become even thicker with time. Mixing becomes more difficult and it may become less tacky and gooey. It will still cure but this may make PC-7® not suitable for every type of application. We suggest storing PC-7® in a cool location. Test product that is older than two years on the side before using in critical applications. Clamping is usually not needed. PC-7® works best when there is sufficiently thick bond. Do not squeeze all of the PC-7® out of the bond. 1/32 inch works well for most flat smooth surfaces and 1/8 inch works well for rough or uneven surfaces. Glazed or glass surfaces present an adhesion problem at 100°F and 95% relative humidity. Temperature can affect the curing process. Cooler temperatures will stall the curing process. Try heating the repair area. High humidity can also slow the curing process. The product may not have been thoroughly mixed. If it is cooler temperatures or older product; you should warm the container to room temperature of higher. If it will mix to a consistent color; it will work. © 2018 Protective Coating Company.